Madeline is allergic to everything and has spent most of her life not being able to go outside, doing her school lessons online with the only people allowed in her little bubble are her nurse and her mum, that is until the new family moves in next door. 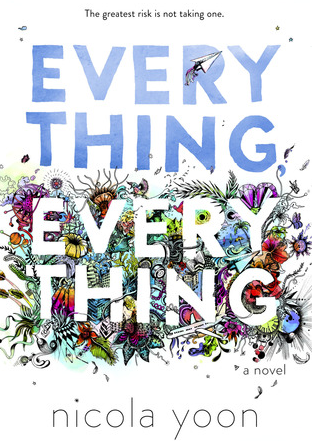 Everything, Everything is quite a sweet book as it follows Maddy and her first love which is plagued with difficulties such as the fact that she can't actually go outside to see Olly and the fact that she is so allergic to everything so that contact with Olly may actually kill her. The book is told from Maddy's point of view, but we also get to see text messages and IM's between Maddy and Olly as well as some illustrations and homework assignments from Maddy which help make this a little different to read and the illustrated parts I found to be very sweet and humorous as they explore the emotions everyone has with their first love. Whilst the first romance aspect of this book is very cute and relatable (despite the fact Maddy can't leave the house) I found that the rest of the book was not as well done and left it feeling undeveloped. Olly has his own issues but these are quite glossed over which makes certain parts of the story lack the emotional impact they were meant to have and the tone of the story completely changes towards the last quarter of the book and goes in a direction that if the book was longer would've been explained better but as it is felt a bit rushed. Overall I think this book is fine. 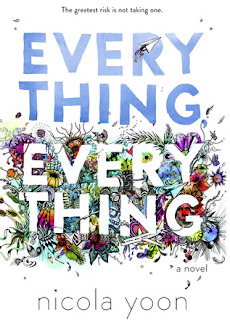 It's an easy read and it has it's good parts that will make you smile but I feel like Nicola Yoon has just tried to pack too many elements into a short book which makes it end up falling a little bit flat.